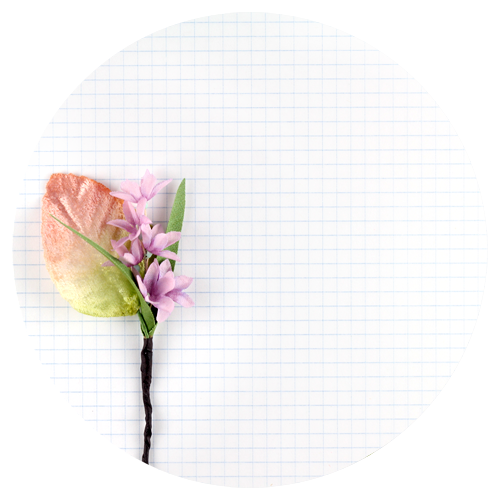 Especially for a table that you’re going to be eating off of…crafting on and the like. 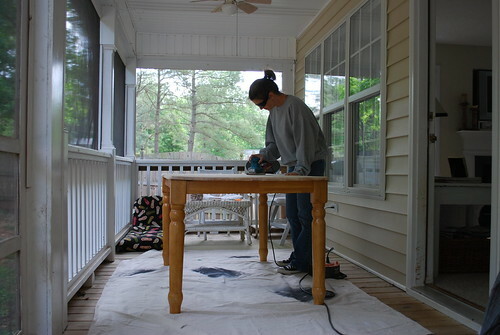 First I dragged it out onto the screened porch and sanded it down. I sanded all the shiny shellac stuff off. My neighbor was afraid…he asked me the next day, “What was all that racket you were making?” …of course…in his nice neighborly way. Then I dusted off the dust and wiped it down several times with a wet lint free cloth. 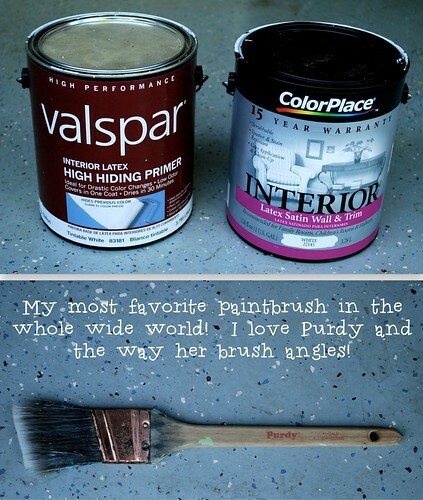 I use a Purdy Paintbrush…that I swear by! I love this paintbrush! I used it to prime the table. 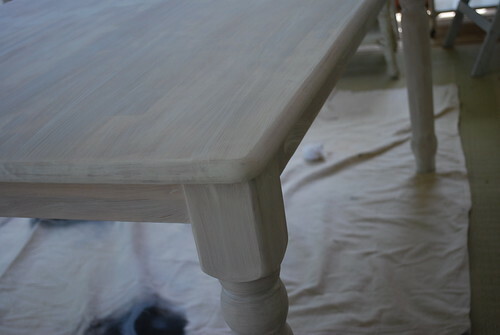 I also used the paint brush to paint the legs and lip of the table and a small roller to roll paint on the top. I put about 3 coats of paint. 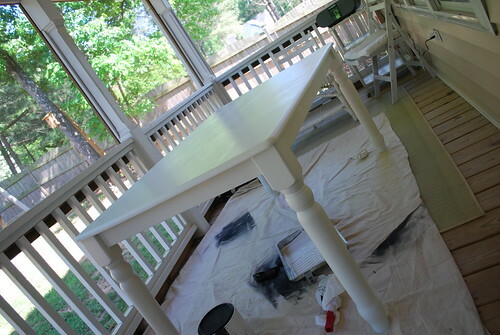 I used Valspar Primer from Lowes and went with a cheaper white satin paint from Walmart. This is probably why I had to put on so many coats. When you go with cheap paint, you pay one way or another…time or money. After, it was completely dry, I sanded the top with fine grit sandpaper…just to smooth it all out. Then I rolled 1 more coat of white paint on the top and sprayed a coat of polyurethane to seal everything. Check out Carrie’s newly painted desk. All the while, a little was creating her own master piece! Her room is bright green and turquoise. You would think she is the Ambassador for World Peace with all the “Peace” signs in her room. 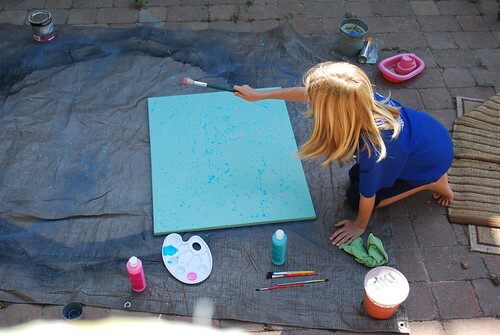 After a little spattering of paint…she proceeded with painting random peace signs all over it. It’s truly a masterpiece! What are you painting this week? The table turned out very nice, thanks for sharing. I think I am going to touch up the paint on my balcony railing this week. 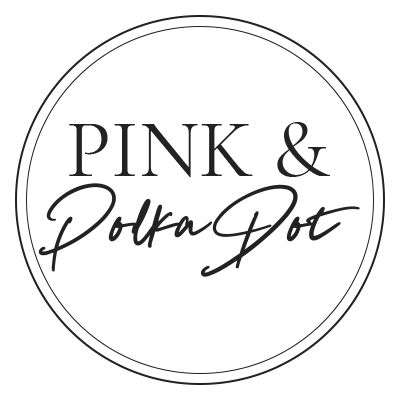 Thanks for the post on painting a table! 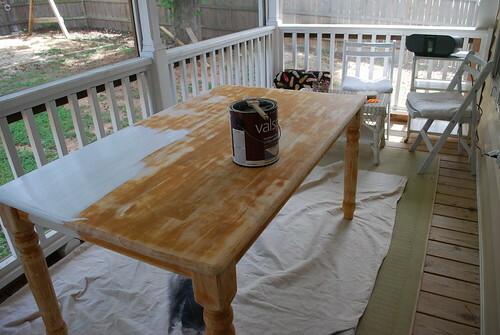 I just decided last week that I am going to paint our kitchen table and have been so nervous about it! You answered all my questions, thanks! I am in the process of painting my table and 8 chairs. I am staining the top of the table and the seats of the chairs in a walnut stain and the legs of the table and chairs I am painting white. The sanding is a lot of work but I really enjoy the process. This is my first big furniture re-do and I am loving it. Good luck on your table. 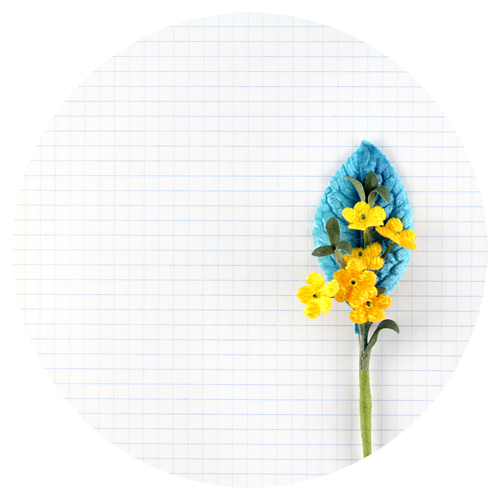 I bought your e-book and can't wait to make my first slipcover…as soon as the table and chairs are done! This is such an encouragement! I found a table exactly like that @ Salvation Army for $35.. I've been intimidated to paint it. Yours looks great! Awesome! It's perfect. Thank you for those tips. Good job!